Chiron was the eldest and wisest of the Centaurs. He was born as a result of an illicit union between Cronos (Saturn) and a beautiful sea nymph, Phylria. Rhea, the wife of Cronos, was about to catch them in the act, so he took the form of a horse in order to avoid being noticed. As a result, Chiron was born a Centaur, half horse and half human, as well as being of the Earth and of the Sea. Chiron was highly skilled at hunting, medicine, music, warfare, and astrology. He was a master teacher whose pupils came to him to find their destiny. He taught Jason how to undertake the quest and he taught Achilles how to be a sacred runner. He also taught Asclepios the art of healing and founded a healing temple on Mount Pelius. Chiron was the last of the Centaurs. The rest of them were such drinkers and carousers that they ended up doing themselves in. One day, Hercules stopped by for a visit and soon came upon some of the Centaurs' wine. Upon discovering that their beloved wine was about to be shared with someone, the Centaurs got very upset. In the big ruckus that ensued, Hercules accidentally shot Chiron in the foot with one of his poison arrows -- which Chiron had taught Hercules to make. Chiron went to his cave in agony, but could not die because he was immortal. Chiron's fate is interwoven with that of another sufferer, Prometheus, a Titan who had joined Zeus in his battle against Cronos. After the victory, Zeus gave Prometheus the job of creating mankind and repopulating the earth. 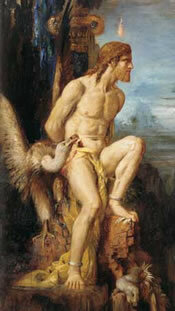 Prometheus was very sympathetic to the woes of the humans and gave them the sacred fire of the gods to keep them warm. Zeus went into a rage, upset about this, and chained Prometheus to the top of a mountain where an eagle would swoop down every day and eat his liver. Zeus declared that Prometheus would only be set free if an immortal would go to the underworld in his place. 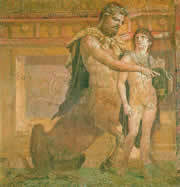 Hercules eventually persuaded Zeus to set Prometheus free in exchange for letting Chiron descend into Hades. I guess you could say that was a win-win outcome. Chiron's position in the horoscope teaches us about the effort it takes to become as spiritually advanced as the great teachers, like Jesus or Buddah. It shows how far along this path we have advanced and what work remains to be done. And it shows where we may endure great suffering to achieve that growth. Chiron is considered by some astrologers to be one of the Social Planets. Becoming such a teacher involves not only mastery of the skills of living, but true enlightenment and the foregoing of self. It involves the complete release of the ego from the body and the comprehension of the spiritual realm. Chiron shows us where we are willing to sacrifice ourselves for others. Its position and aspects in your chart give some clues as to whether you are truly selfless in this sacrifice or whether there is still a sense of "victim" involved. As a maverick planet, Chiron represents that which is different, outside of the bounds of established living, just as the mythological Chiron lived in a cave, alone and separated from others. Since Chiron spends as much as seven years in each sign, the sign itis in at your birth shows what kind of a vision of the new world you and most of your siblings share. Chiron's rulership of a sign has not yet been established, and maybe won't ever be. It is easy to see the association with Sagittarius -- the Centaur, the teacher, the wise one. 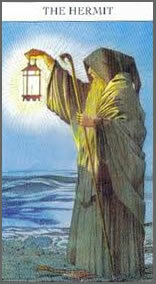 But it is also easy to see how it belongs to the health issues of Virgo and the Scorpionic release of the soul. Perhaps Chiron is a co-ruler of all of these signs. Chiron was discovered in 1977 by astronomer Charles Kowal, during a time of great visionary enlightenment -- the "dawning of the Age of Aquarius". Chiron is a centaur, one of several types of space objects that are considered minor planets. It takes between 49 and 51 years for Chiron to complete a journey around the Sun. It follows an oblique path, running for part of the trip between Saturn and Uranus, then slipping between Jupiter and Saturn as it moves closer to the Sun. Because of Chiron's elliptical orbit, it spend as little as two years in Libra and Scorpio and as much as nine years in Aries. Chiron turns retrograde once each year. The retrograde period lasts four to five months, depending on which sign it is in.